I recently returned from a blissful one week trip to Samana. Where’s this you ask? Samaná peninsula is a small, relatively undiscovered strip in the northeastern section of the country. I like to refer to it as “Tulum before Tulum became over-discovered”. There’s gorgeous powdery soft beaches lined with sky high palm trees (you might even stumble on an iguana or two), lip-smackingly good Dominican classics like tostones and mangú, colorful small towns and enough adventure to suit a lifetime. 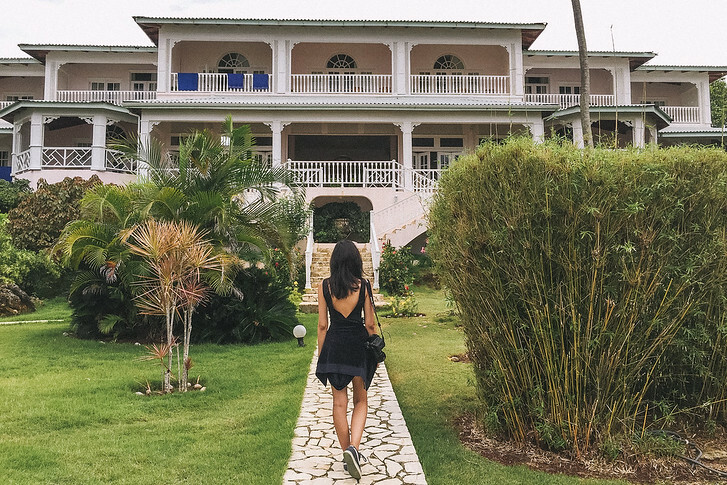 This post will focus on where to stay in Samana and cover my personal choices for the best resorts in the Dominican Republic to suit every type of traveler. There’s the 5 star all inclusive luxury resort, the bohemian, sea side yoga retreat hotel, tree house style huts for traveling families with kids and green, eco-chic properties. Read on to discover the best resorts in the Dominican Republic! Here’s a handy chart of our recommended Dominican Republic hotels. All include free wifi and are known for comfort, good location and great customer service. One step onto the property and you’re greeted with fresh passion fruit juice and swept on to the oasis that is Sublime Samaná. The incredibly stunning Dominican Republic hotel is located in Las Terrenas, and features beautiful 1 and 2 bedroom suites as well as private villas available to rent for larger families or groups. The rooms even come with jacuzzis on the balconies! Each Sublime Samana villa comes with a cabana and the hotel is located right on a stretch of the beach that makes for the perfect sunset. The luxury hotel restaurant is perfect for those looking for elevated Dominican classics like foie gras in Dominican dark chocolate. The Bannister Hotel is a gorgeous property built like the interior of a ship with a beautiful indoor-outdoor lobby (you can pull up your yacht to dock right at the bar if you would like!) and a winding central circular staircase. 1 and 2 bedroom rooms are quite comfortable, or splurge on a suite with ocean views. Our room was very spacious, with a separate bedroom area, kitchen and huge living room. It’s the perfect place for couples, family reunions, you name it! Best of all, the Bannister is ideally located close to both Los Haitises National Park (you can book a day trip with the on-site tour operator) as well as El Limon waterfall. Right behind the hotel is the marina, so you can charter day trips or take a sailing afternoon. Villa Serena in Las Galeras is the perfect hotel retreat. Rooms have a view of the ocean, there’s a calming on-site pool and even a private island just a short kayak away. The property is lush, relaxing and comfortable. What Villa Serena is most known for are it’s yoga classes. Beginning and advanced yogi’s are welcome to take yoga classes in the circular rotunda each day. Meanwhile, if you’re looking for a complete holistic retreat, on-site Chef Darko can guide you through the key elements of a raw food diet and prepare complete three course raw food dinners. We tried yoga, water yoga as well as the raw food meals and felt instantly recharged and refreshed! Paraiso Caño Hondo is located within Samana penninsula’s Los Haitises National Park, a beautiful mangrove and island rainforest straight out of scenes from Jurassic Park. The Eco Lodge has multiple swimming pools with beautiful mini waterfalls and is the perfect escape for families with children. Meanwhile, the on site restaurant offers classic Dominican fare like roasted chicken, grilled fish and rice and beans. The natural pools spill into one other creating a gorgeous layered effect while there’s lots of mini waterfalls for the kids to splash about it. The best part is the slow boat ride you can opt to take to arrive to Paraiso Caño Hondo hotel – it takes you through Los Haitises’s twisty, sheltered mangrove waterways. Samana bay has SO many resorts to chose from, but I don’t think anything comes close to the uniqueness of the Tree House Village! First off – this incredible hotel in Santa Barbara is both adventure and accommodation. It offers zip-lining above the forest (exhilarating – try going upside down!). We tried 17 different zip lines throughout the afternoon, each going higher and higher above the canopies and daring ourselves to swing in precariously more thrilling poses. You can read about that adventure activity in more depth in this post. Now about the rooms! This specialty hotel in Samana features actual tree houses built directly in the forest. These aren’t bare bones, budget accommodation though. Various tree house options are available, from bunk bed styles to villas with views of the forest and gorgeous glamping interiors. 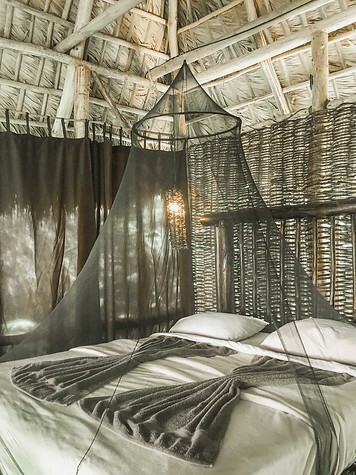 Smaller tree hut rooms higher up in the forest canopy are perfect for kids while larger bedroom huts with ensuite bathrooms and colorful hammocks are great for honeymooning couples. And that’s it! 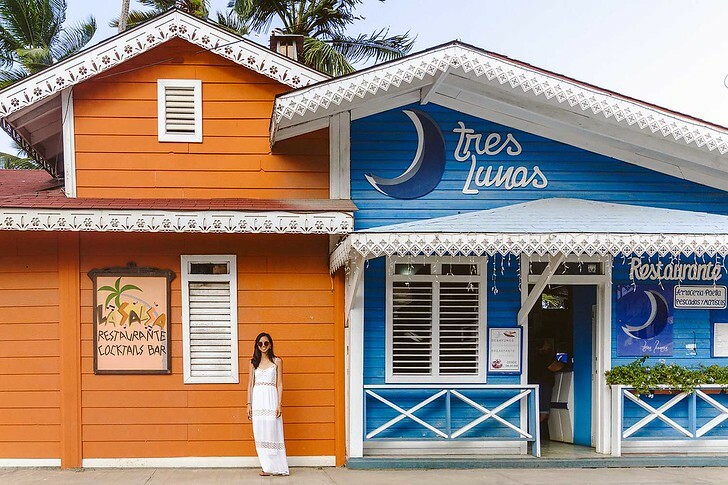 Our complete guide to Samana’s best hotels to make the most of your stay. Whether you’re looking for ultra-luxurious comfort, the most unique accommodation or a family friendly villa, these top Samana hotels are sure to please. From NYC, we flew to Santo Domingo. US visitors are charged a small tourism entrance tax, but typically this is bundled into the cost of airfare. Set fare alerts and check for flight deals here. We also hired a van and local driver to take us all around Samana. It was a great decision and enabled us to see much more of the region, but know that roads in the DR can be challenging. For example, on our long drive up to Las Terranas, the van got a flat tire that left us roadside for a couple hours. Samana has all sorts of accommodation. From charming yoga and surf retreats to luxury modern hotels, plus everything in between. Book accommodation in advance to save. Lastly, be sure to visit the Dominican Republic with travel insurance. Whether your bags are delayed, your phone gets stolen, or you get injured and need to be hospitalized, travel insurance will help when you need it most. We got a bad case of food poisoning during the trip and missed out on a full day of activities. Get a quote for your trip here. Our trip was hosted by the Dominican Republic Tourism Board. Our decision to write this post and all opinions within are our own. Wow these are stunning! I plan to do more traveling soon so thanks for sharing these great finds! All of these look amazing! The tree house is my favorite. I may put that on the list for my next trip to the DR.
Great hotel options but for me it has to be the tree house village! Dang girl! You make it so enticing. I def want to visit all of these spots now!! what a great trip review. I need to start doing some reviews. They can take you places. Thanks for sharing this post…it is very timely, planning a trip next year there. Your pictures definitely captured the beauty of the Dominican Republic. Looks like I could find a few hiking spots to explore as well. So beautiful!! It would be so hard to choose. I prefer all inclusive resorts. I went to Punta Cana for my honeymoon, but I’d love to go back to the DR! The Tree Houses look awesome! These are all so beautiful, from the surroundings to the decor. I love them all. The Dominican Republic looks amazing! I’m with you, Sher. I never enjoy all-inclusive resorts. I would love to stay in the tree houses and try the ziplining course with my teenagers. That would be son much fun! Wow! The Dominican Republic looks like paradise! The beauty of each lodging location is stunning.The Paradise Cano Hondo hotel is especially beautiful with the waterfalls and rainforests. Definitely reminds me of Jurassic Park! Stunning photos, I love the beauty of the Dominican Republic. Nice there are so many great options for places to stay! 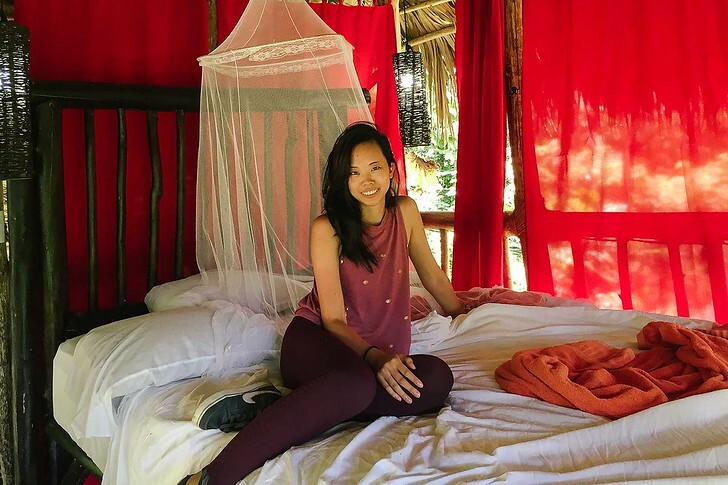 I stayed at the Tree House Village last year and was blown away! If you’re okay with sharing your morning coffee with a few lizards running up the wooden banisters then this is this place for you. Such a wonderful experience! That place stole my heart. The Dominican Republic looks amazing! These are all so beautiful, from the surroundings to the decor. I love them all.